In what is probably going to be my final post of 2017, it's time for an update on my latest exploits with the Starwave 80 ED-R and the Altair Hypercam 183c. Christmas has once again been kind to me with a lovely selection of Astro gifts from family, and for once, the new astro toys didn't bring on the traditional onslaught of crappy weather for days on end. At least, not straight away anyway. That part was delayed by a day or so which give me an ideal opportunity to get out under some great skies. Boxing Day night 2017 and the forecast was for freezing cold, clear and still conditions from sunset to sunrise. I set up my imaging kit and gave first light to my new Light Pollution filter and first use to my new case for the hand controller of the AVX mount. My objectives for the night were to image the Iris Nebula, the Flame and Horsehead Nebulae and the Orion Nebula. Outside of these targets, I was happy to just fill in any spare time with a couple of other targets. At the moment, I have to wait for Orion to rise above the rooftops to allow me to get them into the telescope's field of view. 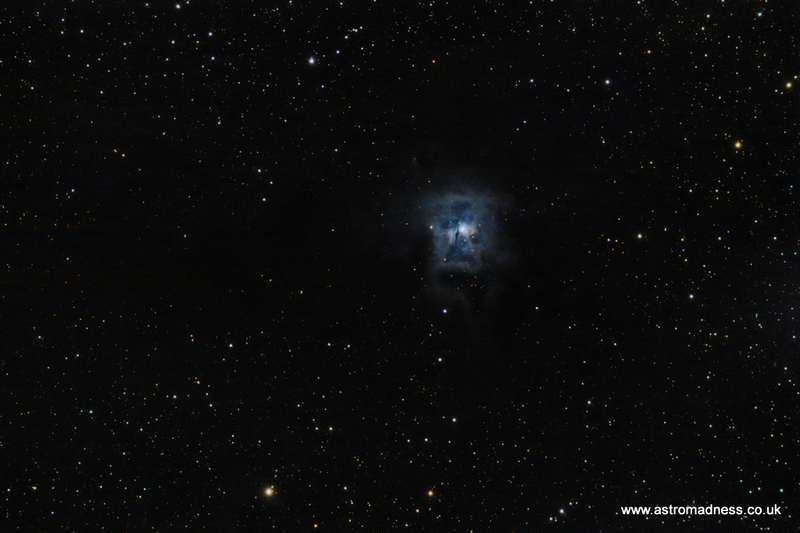 That doesn't happen until about 11.30pm, so first target was to be the Iris Nebula. While capturing images of my targets, I also wanted to use a variety of different settings within Sharpcap pro. I've included the settings with each of the images. 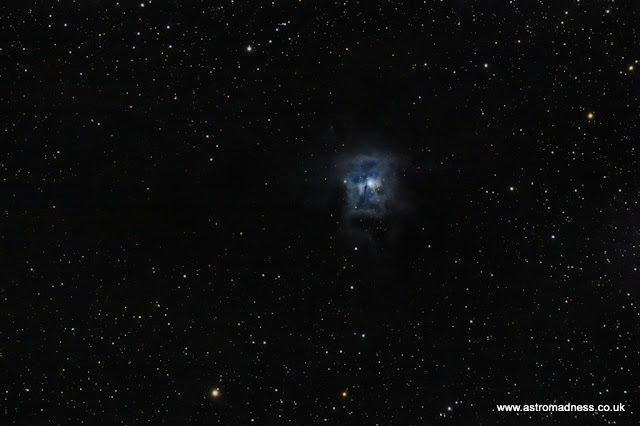 The Iris Nebula is a reflection nebula found in the constellation of Cepheus. At around 1300 light years away, it's comparatively close to us. When you trawl the internet looking for images of the nebula, it's often presented as a lovely blue colour with much darker grey or black nebulous clouds of dust and gas around it. My hope was to at least be able to capture some of the blue colour, and possibly a little bit of detail within the dust clouds. In reality, I think I achieved both these things with some success for a first try. 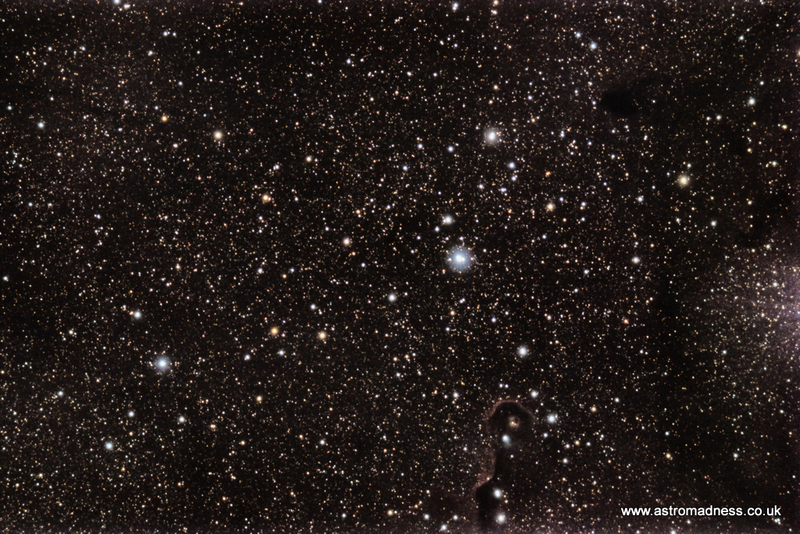 Another target in Cepheus was next on the list. This time an emission nebula known as The Elephant's Trunk. This is quite a tricky target to image, especially as it is very red in colour. There are many clear images taken by CCD cameras all over the web, but I think that to expect that level of detail would be unwise. So, for this image, I was happy to just find out what I could obtain with a comparability short total exposure time with a CMOS sensor. Once I had stacked the image and performed the initial image stretch of the stack, it was obvious though that I was slightly off target. Nevertheless, I was pleased to find that I could make out some detail of the trunk and also other areas of dark nebulousness. With 2 targets down already for the evening, Orion still hadn't risen high enough in the sky to allow me to image it through the telescope from it's position on my garden pillar. Looking around the constellations that were visible, I decided to try a different type of target. I chose M35 which is an Open Cluster in the constellation of Gemini. 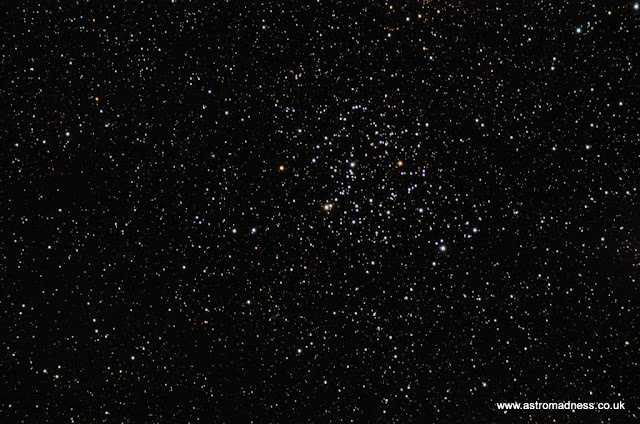 Open clusters tend to show up well in refactor telescopes, displaying good levels of colour in the final image. 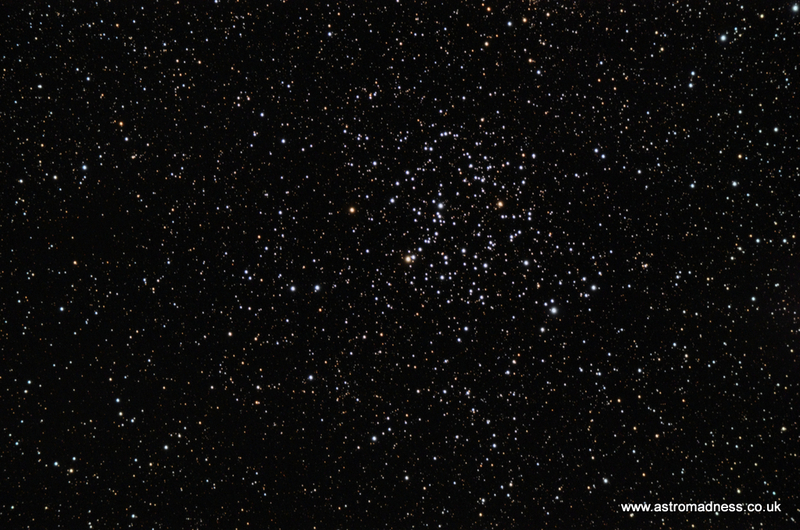 M35 is in close proximity to another cluster NGC 2158. This was out of the field of view of the final image, with M35 comfortably filling the sensors image frame. In the final processed image, though you can see some yellow and white stars, I failed to get anything in the blue colour. I think this might be down to my processing skills more than the quality of the data. At last, the constellation of Orion was high enough over the rooftops to bring it into view. The next pair of targets are very easy to find. 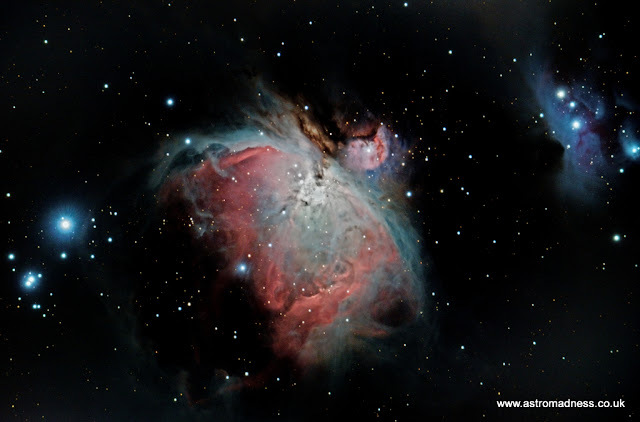 The appear either side of the star Alnitak in the belt of Orion. 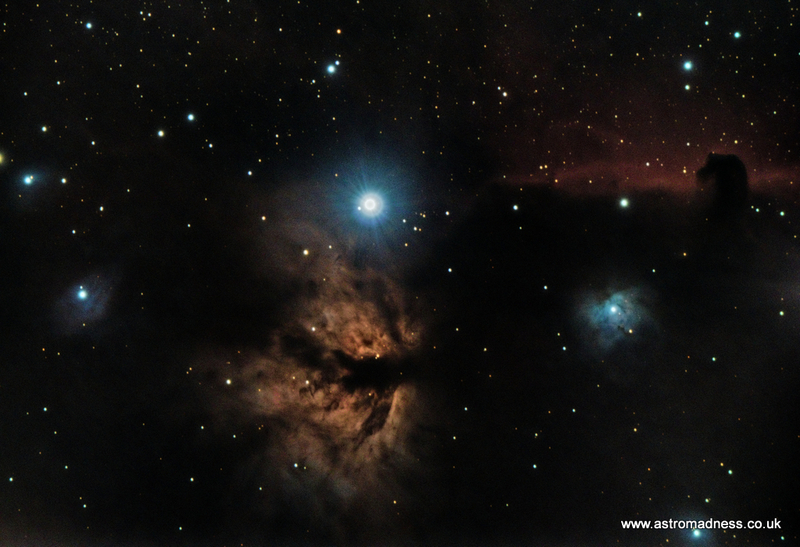 I have managed to capture some detail of these nebulae with a DSLR before, but only a single shot. Those results were promising, so the target was high on the agenda of features to return to. Easy to find, but quite tricky to image if you want to get both features in the same field of view. I didn't realise until after stacking and the initial histogram stretch that my alignment was slightly off, only capturing a portion of the Horsehead. What I think makes it tricky is that you have a bright star Alnitak somewhere near the centre of the frame, the Flame which shows up well in CMOS sensors and the very red area around the Horsehead, traditionally the subject of CCD images. The Hypercam dealt with it all incredibly well though. If only I had the image aligned to get more of the Horsehead in it though! This is the target that seemingly everyone attempts to image at one point or another. The Orion Nebula is very bright and shows up very will in all sorts of different photographs. Though this was the target I wanted to image the most, I had to leave it until last. Bloody rooftops! So, as the ice was forming freely on the scope and mount, the dew band were doing their job very well and the optics of the scope were being kept crystal clear. The internet is adorned with thousands of different images of this fantastic nebula, each representing the owners personal interpretations of the target. I wanted to add mine to that list. My previous attempts with my DSLR have been poor, so I was apprehensive as to how this was going to turn out. Looking through various forums, plenty of people seem to be having great results with the Hypercam. At the end of nearly 9 hours outside, occasionally nodding off in the shed in front of the fan heater with the cricket commentary on the radio, I managed to get data on 5 targets, each with their own challenges. My first thing to work on though is the framing of the target. I need to get used to taking some images and stretching the histogram on the sub frames to make sure I can get all the target in the field of view. I feel as if I am now getting to grips with the process of collecting the data within SharpCap and this is now becoming a little more routine. Images will improve in quality with more data on each target. Next time, I'll stick with only one or two objects for the evening. In total, it would be great to get 2 to 3 hours on each target. My biggest improvement at this stage of the hobby will be in processing. The use of PixInsight has brought on my processing to the next level, and there is a huge amount to learn about this software and it's routines. I am now a fully paid up license holder of the software so I am determined to make it work to the best of my ability. So, that's 2017 all wrapped up for me astronomy wise. The forecast for the next couple of nights is rubbish, and the moon phase is approaching full moon. If 2018 proves to be as productive and pleasing as 2017, I will be really pleased. I have my first star party at Kelling Heath booked for 2018 and look forward to experiencing a different location and new circle of people. That does mean that AstroCamp will take a back seat in Spring because the dates clash. Nevertheless, I'm sure the dark sky of rural Norfolk will more than make up for it. Finally, I would like to thank anyone who spends a few minutes reading my posts. I have no idea how popular or unpopular these pages are, but I have always maintained that the primary reason for the blog is a method for me to keep track on my hobby. If others find it interesting, great! Bonus!